I would like to borrow the title of a book by Michael Griffiths, Cinderella with amnesia, as the focus of our meditation for today. First, you need to know my affection for the Cinderella story and all things Disney. I proposed to my beloved Kim in Cinderella’s Castle at Walt Disney World in 1992. We spent our honeymoon at Disney World. And it is our favorite place to go with our four children as often as we are able. So I thought Mr. Griffiths’ title would be a great vehicle for working out a Gospel truth that we should all recall on a daily basis. You know the story: Once upon a time there was a beautiful girl named Cinderella, who lived with her two stepsisters and stepmother. 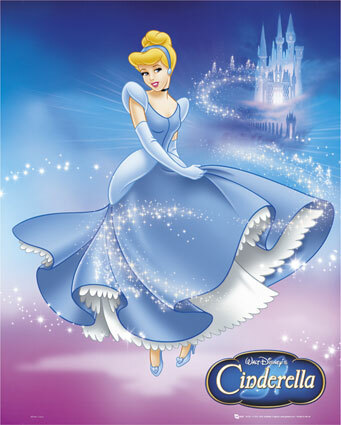 They disliked Cinderella and made her do all of housework—laundry, dishes, cleaning, scrubbing, and mending. Despite all this hard work and the dirty, ragged clothes she was forced to wear, Cinderella remained kind and optimistic. You’ll recall that the king decided to give a ball in honor of his son, the prince. Invitations were sent out to all the young, unmarried girls in the kingdom. Cinderella and her two stepsisters were invited, but her stepmother was only concerned about getting fancy gowns for her daughters. The two sisters teased Cinderella, who had only rags to wear, and went gaily off to the ball. As tears filled Cinderella’s eyes, she heard a voice asking, “Why are you crying, child?” It was her Fairy Godmother, who had a plan to get Cinderella to the ball. A pumpkin from the garden was transformed into a beautiful jeweled coach. Her two little mice friends were changed into prancing horses to draw the carriage. Some frogs became footmen, and two rats became the coachmen and coach driver. Finally the Fairy Godmother touched Cinderella’s ragged dress and it became a stunning white gown of silk, adorned with diamonds and pearls. On her feet was a pair of beautiful, one-of-a-kind, glass slippers. Cinderella was ready to go to the ball, but she had to leave before midnight. At the stroke of midnight, the coach would turn back into a pumpkin, the horses would become the mice, the coachmen rats, the footmen the frogs. And the beautiful gown would turn back into her ragged dress. How impressed the prince was when Cinderella entered the ball room! Soon they began to waltz. The stepmother, not recognizing the young girl, said she was a wonderful dancer. The sisters whined that her gown and shoes were far better than theirs. The hours flew by . . . and then the clock struck midnight. Terrified, Cinderella rushed out of the ballroom, but in her haste she lost one of her exquisite glass slippers. The next day, the prince began visiting every house in the town to find the owner of the missing glass slipper. Eventually he arrived at the home where Cinderella lived with her stepmother and two stepsisters. Both stepsisters tried to make the shoe fit, but to no avail. Cinderella entered the room and meekly asked if she could try on the glass slipper . . . and it fit! Cinderella and her prince went off to the palace, where they were married in splendor and lived happily ever after. But what about the time between midnight at the ball and the day her prince arrived? Cinderella was . . .
What Cinderella had all but forgotten in her dejected, discontented condition after the ball was the feeling of being desirable, not despised . . . delightful, not derided . . . dignified, not disgraceful. Her “amnesia” had separated her from her ultimate destiny, which was the radiant bride of the prince, living a life adorned in splendor. There’s a great Gospel truth contained in this story, one which we often forget: the pursuit of the Prince after His beloved. Just as Cinderella’s prince searched the city, our Prince is tireless in His unceasing pursuit of us. This great, true love story began all the way back in the Garden of Eden. Just as Cinderella’s spectacular ballroom gown was transformed into filthy rags upon the stroke of midnight, so Adam and Eve’s sparkling innocence was transformed into ugly sinfulness in the instant they ate the forbidden fruit. And just as terrified Cinderella ran from the prince, so Adam and Eve ran from God . . . as if any of us can hide from the God of the universe! But just as Cinderella’s story ends in joy and delight, so does ours. God has never ceased His pursuit of us, and just as He restored Adam and Eve, He promises to restore us also. And His pursuit does not end when He saves us and raises us from death to life; God pursues us each day with a love that will not be denied and will never disappoint. Cinderella is a wonderful picture of Christians who have been promised a seat at the royal banquet table, but all too often run away from our Prince, thinking that our ongoing struggle with sin makes us too dirty and disreputable to be fit company for His heavenly perfection. But there is no need to run or hide! One day we will be the radiant bride of Christ, without spot or blemish. The wrinkles will be gone and the ugly warts will be removed. The filthy rags we currently wear will be replaced with the resplendent robes of the righteousness of Christ. Christian, you needn’t run from the ball; run to your Prince, no matter what the circumstance, no matter how dirty and raggedy you may look or feel. He is always waiting with open arms to receive you and He will gently slip the grace-filled, Gospel-saturated “glass slippers” of your salvation back on your feet. “I have loved you with an everlasting love,” He whispers to us; “I have drawn you with loving-kindness . . . Again you will take up your tambourines and go out to dance with the joyful” (Jeremiah 31:3, 4b).